Smile Cliniq had no problem with me being afraid, gave plenty of reassurance and in the end it all went very well. I had a thorough explanation of the problems with my teeth and gums, given a very precise plan of action and was able to regain dental health. 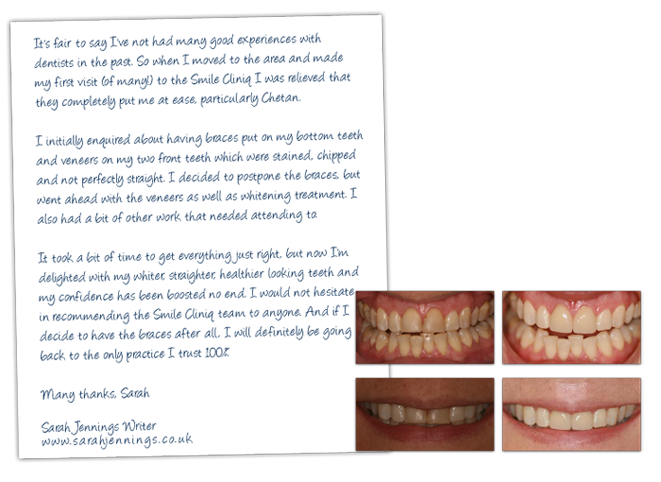 I highly recommend Smile Cliniq in St Johns Wood and Finchley, London. Since childhood I have always been a very nervous dental patient and following a bad sedation experience in my mid-teens I was overly anxious and prone to panic attacks just at the thought of a visit. The surgery itself & the sound of the drill was too much to bear and for close to 25 years I refused to go anyway near a dental surgery. Now in my forties it was obvious something had to be done and I was recommended Smile Cliniq in Finchley and St Johns Wood. 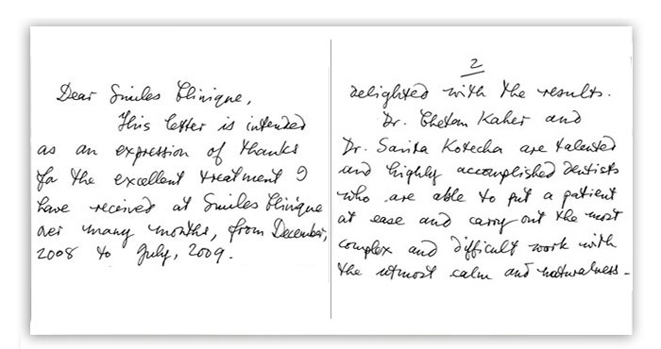 From the outset Dr Chetan Kaher & Dr. Evdokia Chasioti seeing I was a very nervous patient, put my mind at ease with their kind words and professionalism. They clearly explained what was needed, completed the work to an exceptional standard and allowed me breaks when I needed them. I cannot fault the treatment I have received in anyway and while I don’t think I will ever look forward to a dental visit, the care I have received at Smile Cliniq makes a trip to the dentist a bearable necessity. 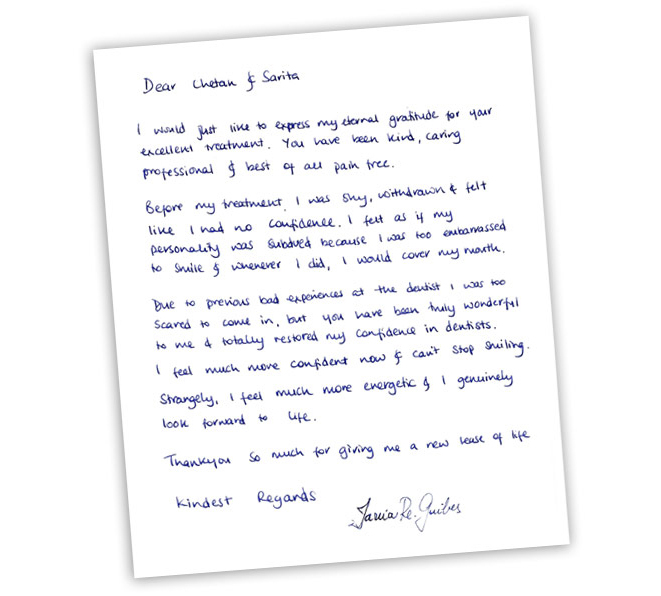 Dear Evy and Chetan thank you so much for everything you have done for me over the past few months, your kindness really has made all the difference. I was pleased with the ambience: light, clean, welcoming. Reception was pleasant, the hygienist Ayu competent and thorough. Here’s why, as concise as I can be and from point to point. 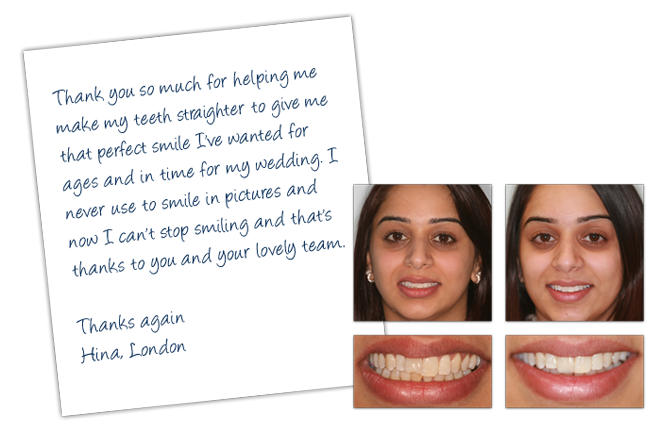 Sarita worked with me making sure I was happy as the transitional period of my teeth was happening and if I had any concerns or problems she made herself available to be contacted or for me to see her asap, she listen to my concerns and work with me explaining my options and listened to me as to how I wanted my teeth to be shaped tooth by tooth patiently until I was happy with the appearance, which was very important to me. Also being able to make an appointment at a convenient time, be it a late evenings, weekend or early appointment, and if I was running late still made herself available to be seen. The clinic is clean and tidy and modern from the waiting area right the way through to practice area, toilet and hall way, which is important. With features of ceiling TV and a choice of viewing or a Netflix movie or music of your choice whilst in the dental chair if you like. Friendly receptionist helpful and polite which is important which could be a turn off to a practice. All in all a good experience worth full star review as they maintained a high and very good service of care through out my braces period. I have been seen by Ms Chasioti several times in the last few months and have had different procedures to help difficulties caused by gum disease. On every occasion, Ms Chasioti has been very thorough and she explains possibilities and answers questions in a clear way. She has an easy-going personality and is gentle and considerate when working. She spends time to make sure that her work is effective and that it feels right and comfortable. I injured my front tooth when I was about 10 years old in primary school. I run into one of my much taller, much bigger classmates!! I was taken to the dentist almost immediately after it happened as my lip was massively swollen, however there was too much swelling to see the full extent of the damage, but the dentist suspected I had killed the nerve and would need a root canal. A few weeks later I had the root canal done. My front tooth began discolouring a few days after the accident and continued to get darker until it became a very noticeable dark grey colour. At the time it didn’t really bother me as I was so young. It was only in later years, when I was about 15 years old that it really started to bother me, especially when I got my braces off which made the darkened tooth even more noticeable, as up to this it was partially covered by the brace itself. I had had internal bleaching done on the tooth when I was about 13 years old and on holiday in New York, as my mum’s friend is a dentist there. The results were good but as I was only able to make it to 2 out of the 3 recommended sessions, the tooth began to discolour again within a few years. When I was around 17 years old I had more treatment, this time a whitening kit that I used at home for 2 weeks. The results of this were good but not perfect and again this only lasted a few years. In recent years, the discolouration of my front tooth has really bothered and is something I particularly noticed in photographs. It was the first thing my eye was drawn to anytime I saw a photograph of myself. Thanks to years of Orthodontics I finally have nice straight teeth that I’m delighted with and take very good care of, however all of this I felt was over shadowed by my grey front tooth. It made me very self-conscious and paranoid about my smile, despite the fact that the rest of my teeth were healthy. 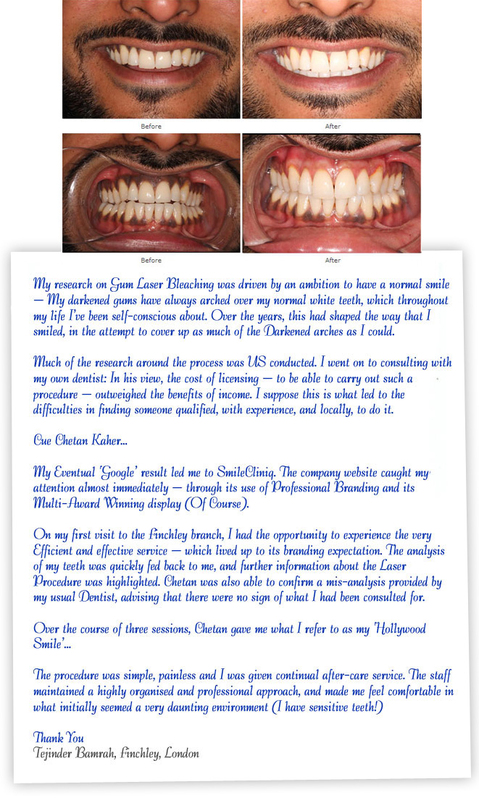 The results from the internal bleaching treatment carried out by Dr. Chetan and his colleagues have been amazing. There has been a massive improvement in the colour of my front tooth and I no longer notice it in pictures. I’m delighted with the results and definitely would recommend this procedure to anyone with the same problem as mine, who like me do not want to go down the road of a crown or veneer. Many thanks to Dr. Chetan and his colleagues!! 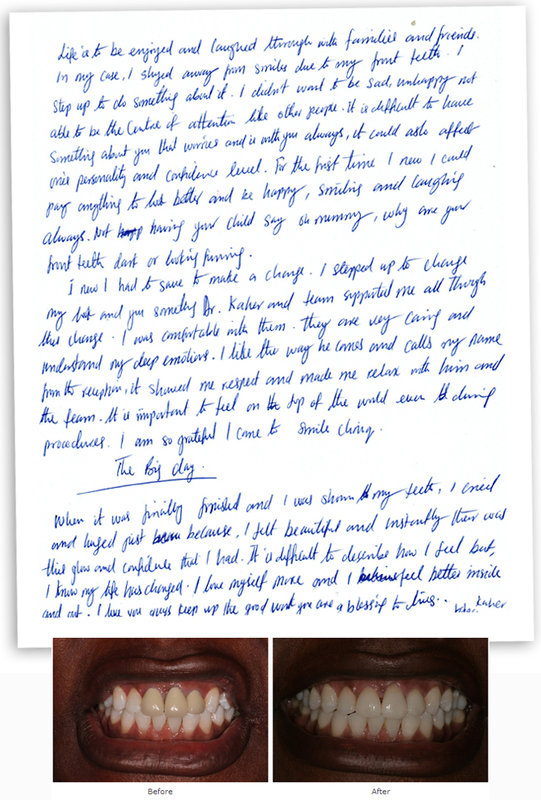 ‘In October 2011 I was involved in a major cycling accident which heavily impacted on my life. I suffered extreme damage to my face and lost one of my upper front tooth. As a professional actor my career was stopped over night and i had to consider the best options for treatment going forward. I did my research and discovered the team at Smile Cliniq. It’s been a long year, due to the nature of the work involved, but as of December 2012 i finally got the all clear on my newly fitted implant. The team at Smile have been superb as have the dental lab they worked with in trying to create the perfect partner for my remaining front tooth. They helped me never to give up hope and were inspiring in there lateral thinking in the search for a solution. The team at Smile and the lab wouldn’t rest until we had a 99.99% match and in my opinion we’ve now achieved that. I just wanted to write to you to say a huge thank you for all your hard work on my teeth yesterday. It was such a long job and you have done such a fantastic job on them. Now I have had time to get used to it, they look amazing and it has made a huge difference for me. 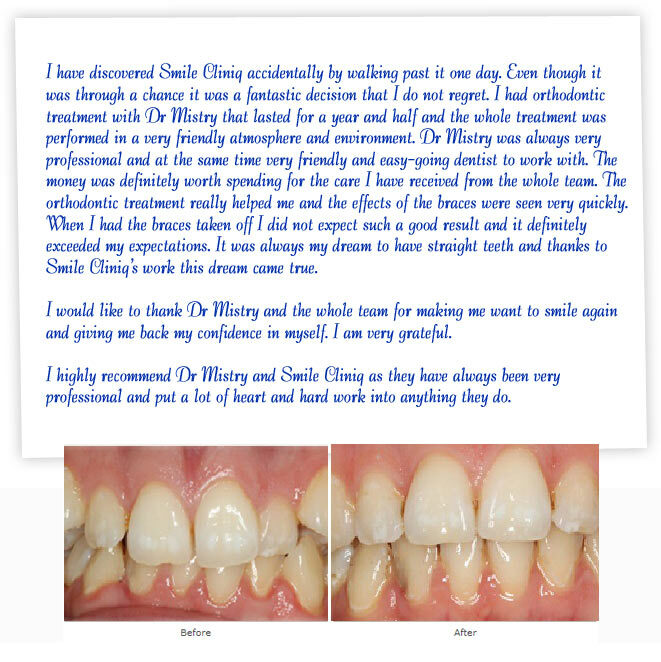 I approached Chetan at Smile Cliniq because I was very impressed with their website and accolades, I’m so glad I did. I had a big phobia about the dentist and consequently quite a bit of work that needed to be done. Chetan was very sensitive to my anxiety and I quickly built up a lot of trust in his professionalism. After resolving the health issues we moved on to improving my smile. I had always wanted to do this, and the way the options were explored were a testament to a great balance between health & aesthetics and what was right for me. 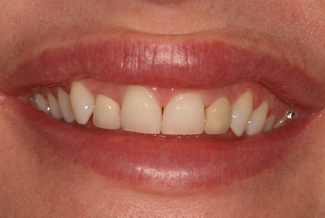 I presented a very tricky case because of 2 front dental crowns that were ancient and an uneven gum line. 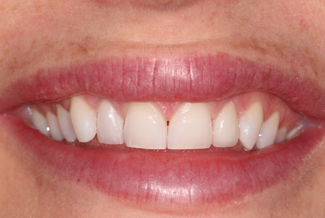 I decide to go for a gum reshaping (Gingival recontouring) and 2 new modern crowns. The results are amazing, a total transformation. I can hardly believe that the confident smile I see in the mirror is mine or that anxious person that feared the dentist now considers him a friend. Thanks Smile Cliniq. I would like to thank everyone at Smile Cliniq. 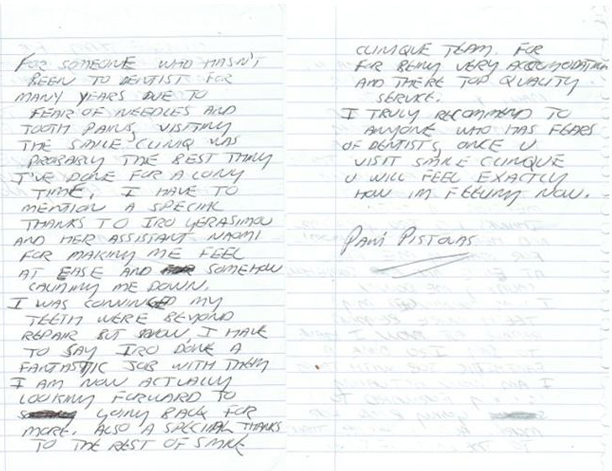 I was treated with the up most care and attention from the beginning, it was all very professional. I liked the fact I could ask as many questions as I wanted and not feel pressurised into making a decision. 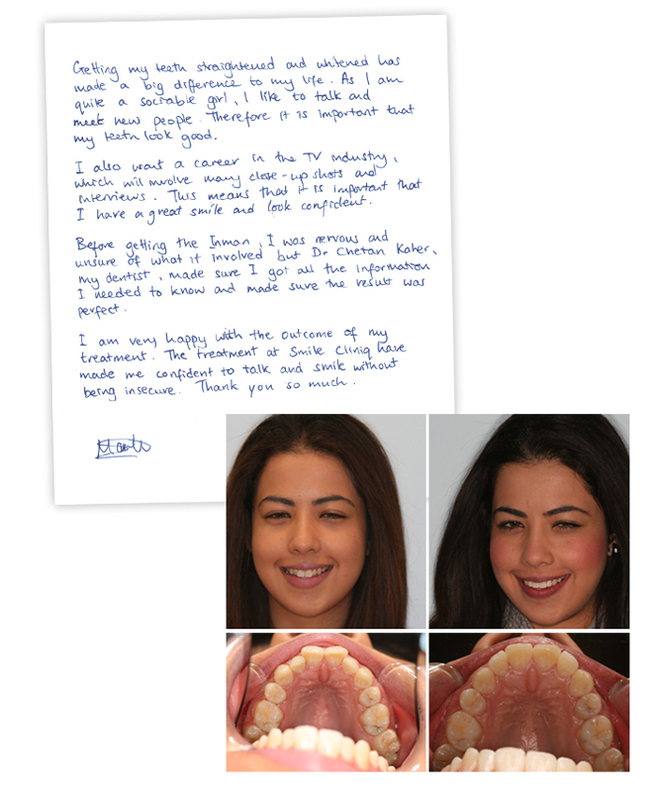 Together with Dr Kaher I decided on what was best and affordable for me and am very happy with the results. I’ll definitely be recommending them to my friends and family. 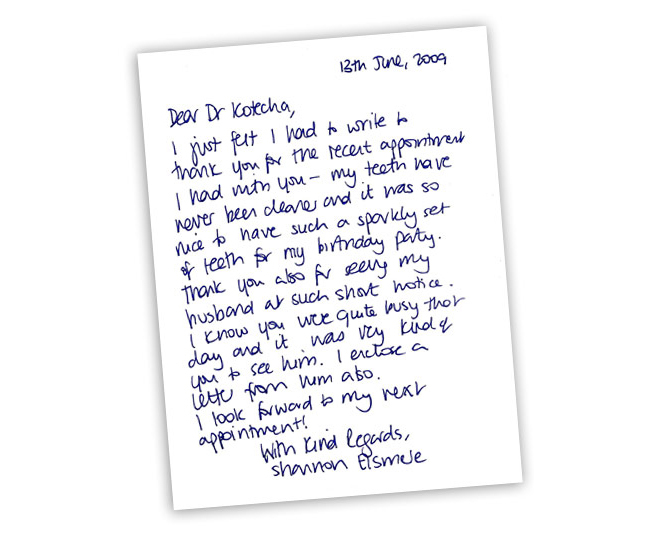 Just a quick message to thank Dr Kotecha & Dr Kaher for the outstanding work they have done on my teeth. When I came I was a nervous patient who had lost the confidence to smile and now I can’t smile enough. It is so brilliant to be able to smile with such confidence so once again thank you very much. Having recently moved to Finchley I needed to find a local dentist as I was experiencing considerable discomfort due to tooth ache. It was almost as if on cue a circular was posted through my door so I thought I would go and check the surgery out as it wasn’t far from where I lived. When I got there I was pleasantly surprised by cleanliness of the practice in addition to the really friendly staff. I remember thinking that this wasn’t quite like any dentist I had visited before…really warm and relaxing. Dr. Kotecha was really nice and friendly, she spoke to me in way that helped to ease the pain and any anxiety I was feeling. She explained the treatment options available to me and I was advised on the most suitable procedure rather than the most expensive. I didn’t even have to have my tooth removed as I initially thought. All in all I found this extremely refreshing. 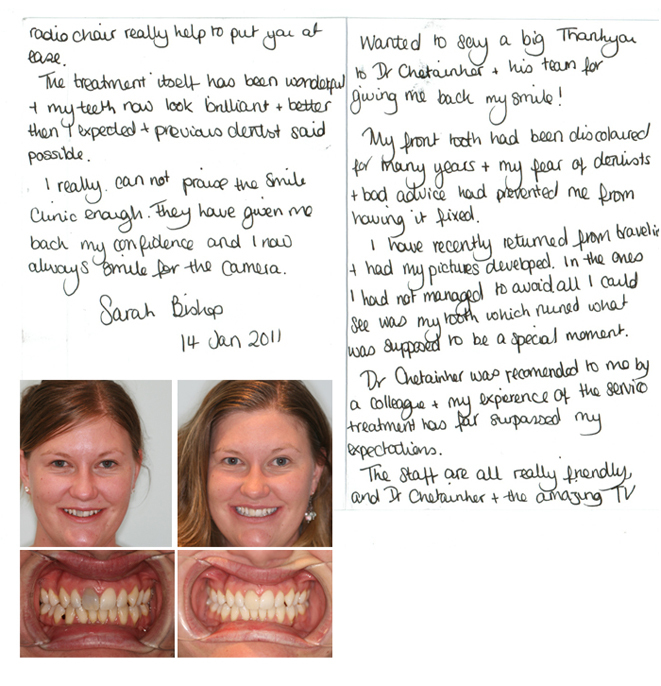 In addition, she also provided me with more practical information on how important it was to brush regularly and advised me to introduce a consistent regimen when looking after my teeth. I truly believe that she delivers a great service that is definitely affordable. Having been with the practice for over 7 months now I have also noticed that they like to keep me informed of new products and services in addition to sending out letters routinely every 6 months to ensure that I don’t forget my regular check up and this I feel helps me to keep on top of things and ensure my smile is beaming. 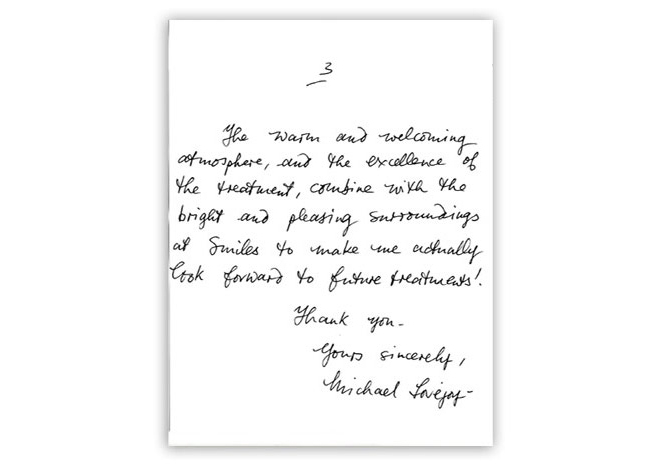 I cannot begin to thank you for the quality level of both the treatment and your practice. Your attention to detail, and the genuine and sincere interest in achieving and surpassing my expectations has been greatly appreciated. I would also like to thank the warmth of all the team, particularly Katie, that made me feel very welcomed, considered and relaxed. 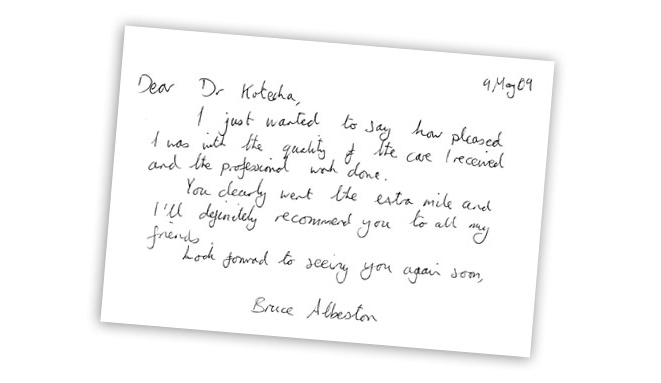 I would have no hesitation in recommending anyone to your practice, and wherever I may move to in London in the future, you have acquired a loyal and grateful patient.